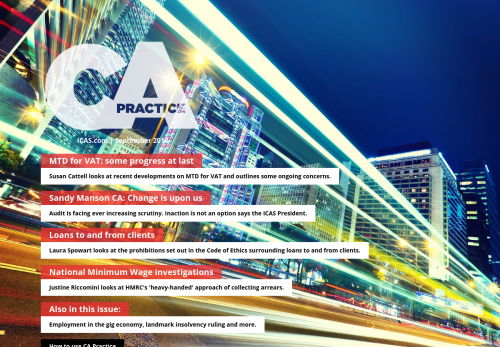 Susan Cattell looks at recent developments on MTD for VAT and outlines some ongoing concerns. Audit is facing ever increasing scrutiny. Inaction is not an option says the ICAS President. Laura Spowart looks at the prohibitions set out in the Code of Ethics surrounding loans to and from clients. Justine Riccomini looks at HMRC's 'heavy-handed' approach of collecting arrears. Employment in the gig economy, landmark insolvency ruling and more.